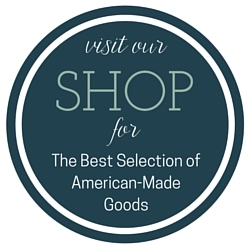 It goes without saying that when you order a sofa, you have to pick out the style, fabric, and finish. But you don’t have to stop there. While most furniture pieces are designed to look great no matter what, you can also add extra details to make a more unique sofa or chair. Welt/Piping: If you look at the edges of a throw pillow, this is probably what you’d find. It’s the thin cord that runs along a seam and it adds a tailored, traditional touch. You can go a step further and make the piping out of a different fabric than the cushion—it adds a graphic touch and works well on pieces that have a great shape. We’ve offered this detail on our Dallas Recliner and Nantucket Collection. Flat Stitches: There are a few different types of stitches that give you a flatter seam: Topstitch is common, but there are others like French seam and blind seam. There’s no need to get into the specifics as the overall look is the same. It’s a bit less fancy than a welt and more modern, so it can tone down a fancier style. Another potential benefit of a flat stitch is that it’s a little smoother feeling when you’re sitting on the cushion. Some flat stitches can be done in a contrasting thread color if you want to add a little interest (it looks like a thin outline). 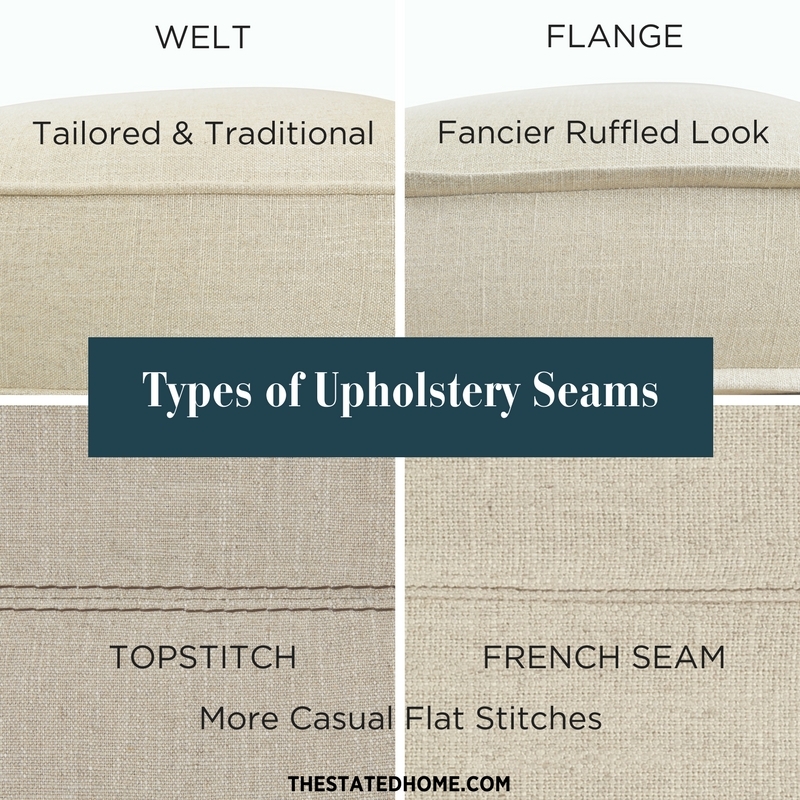 Flange: A flange is when the cushion fabric extends outside of the seam to create a border of flat fabric – think a ruffle without all the folds. Usually this is something found on a throw pillow, but a few sofa styles also have this on their (mostly back) cushions or on slipcovered pieces. A flange is a great way to add a subtle fancy, formal touch. 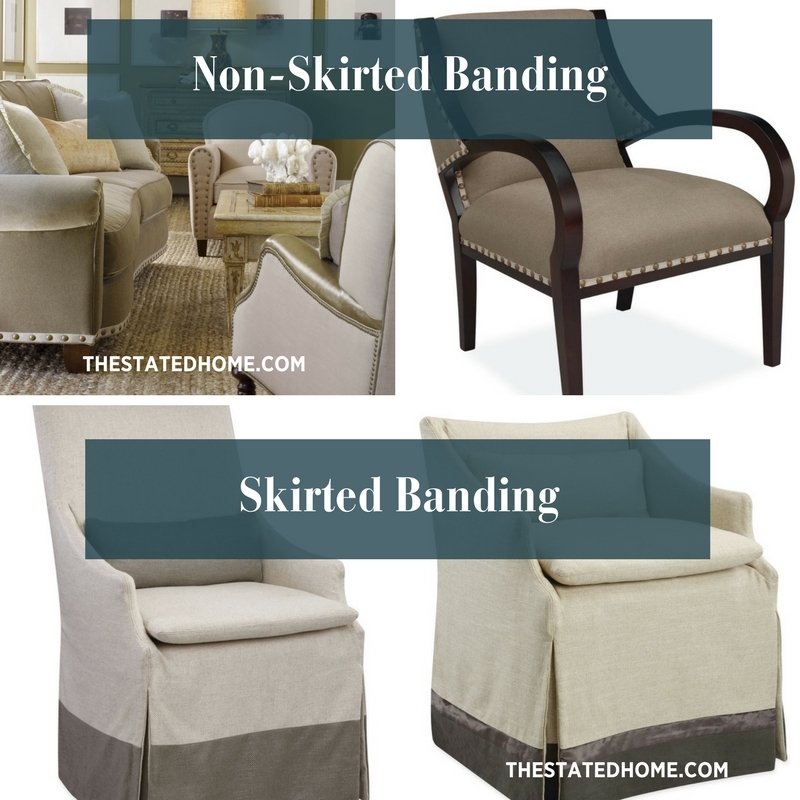 If a chair or sofa has a skirt, you can add a band of different fabric to the bottom. It’s a chic touch that looks especially great on a set of skirted dining chairs, since it breaks up the monotony of all of that fabric. If you’re going to do banding, don’t go overboard. Keep it on one type of furniture in a room (so if you’re doing it on a set of arm chairs, don’t also put it on the sofa). Skirt bands can range in size from 1 to 9 inches, depending on how dramatic you want to get. You can also have banding on pieces without a skirt. This is done by taking fabric (we love using linen!) and applying about ½-to-1 inch of it to the bottom of a piece of furniture. Just know that it needs to be accompanied with nailheads to keep the band in place (more on nailheads below). This is a great design detail that looks good in a variety of styles, except if you’re going super modern. Tufts are when the fabric is sewn into the cushioning to create dimples. There are two main types of tufts: Diamond and Waffle. 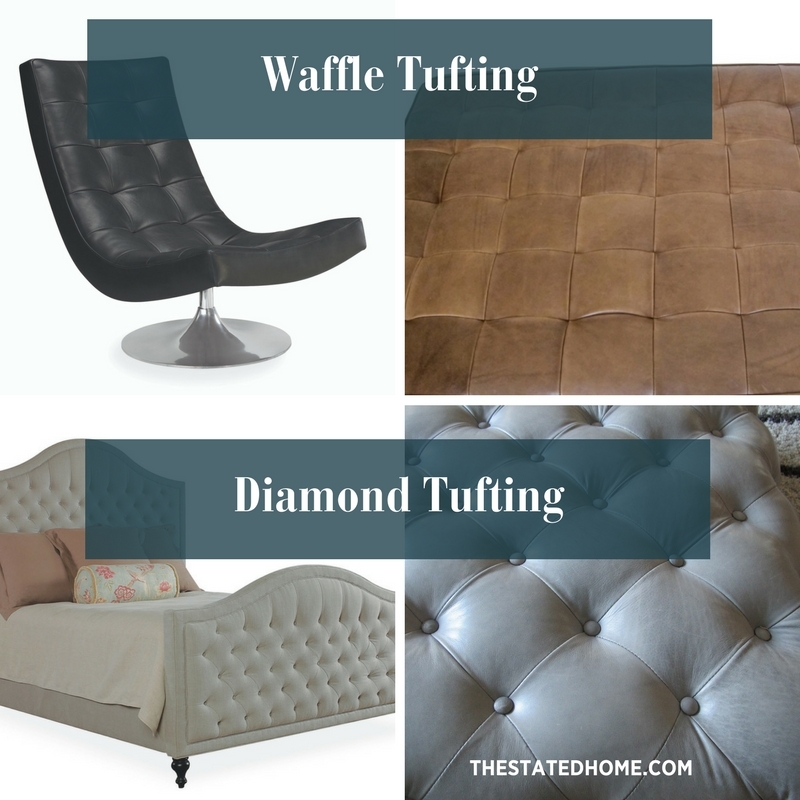 Diamond Tufting: This is when the tufting creates a diamond pattern in the fabric. The dimple is topped with a button, creating a very plush surface that looks more formal. Diamond tufting is what’s on Chesterfield sofas like our Cambridge and is a popular choice for headboards and ottomans. You can change the buttons too – switch out the fabric covering them or use a different material like pearl or tortoise. Waffle Tufting: This tufting is when pieces of fabric are sewn in square patches with a dimple where the seams intersect. You can have a button in the dimple or not, it’s up to you. This is the most modern version of tufting and adds nice texture without getting too fancy. It can have a mid-century feel to it and also goes great in more masculine rooms. Nailhead trim can change the look of a piece to be more rustic, formal, or modern—it all depends on the finish of the nail and how it’s applied. (We did an in-depth blog on nailheads recently if you want a good overview on using them.) Nailhead trim is typically a traditional design touch, so if you’re going for a really modern space, you probably wouldn’t use it. But if you like a mix of modern and traditional, nailheads can be your best friend. 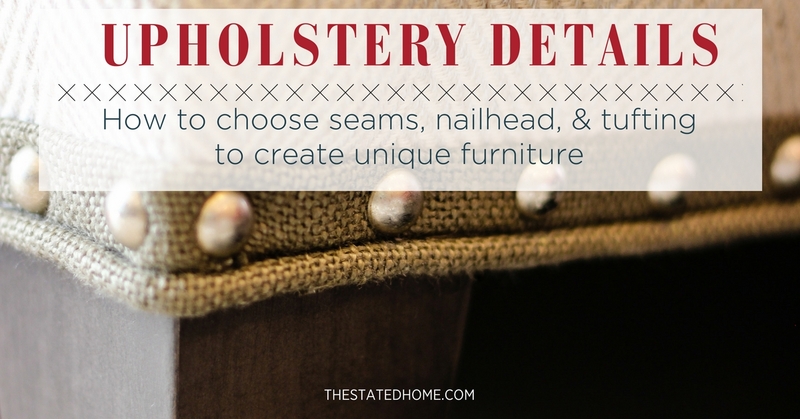 Nailhead trim is applied to the borders of furniture—either to individual parts or the whole piece. If you want to keep it subtle, than just put nailhead around the base. If you want to make more of an impact or draw attention to a cool shape, go around the border of the whole piece. Nickel: Probably the most commonly seen kind, nickel nailhead is silver and can be matte or shiny. Nickel looks great on more modern furniture styles and it can add a glamorous touch to traditional styles. It really pops on darker colors like navy or charcoal. Polished Brass: Yellow and shiny, this nailhead looks like gold jewelry. It adds a glamorous, formal touch that really stands out. It looks fantastic against black! Antique Brass: This nailhead is a dull brass and is a little less noticeable than nickel. It can add a rustic touch or a traditional feel to furniture. Use this when a gold tone looks best with the color of the furniture, but you don’t want to use a bright brass. Vintage or Aged: Nailhead that has been hammered or colored to look worn, this option is definitely more rustic and masculine. It would be great on a piece of furniture going in a cabin or man cave. Amp up the rustic quotient by pairing with a distressed leather. Tack: Small, dainty tack trim is great for a very subtle touch. 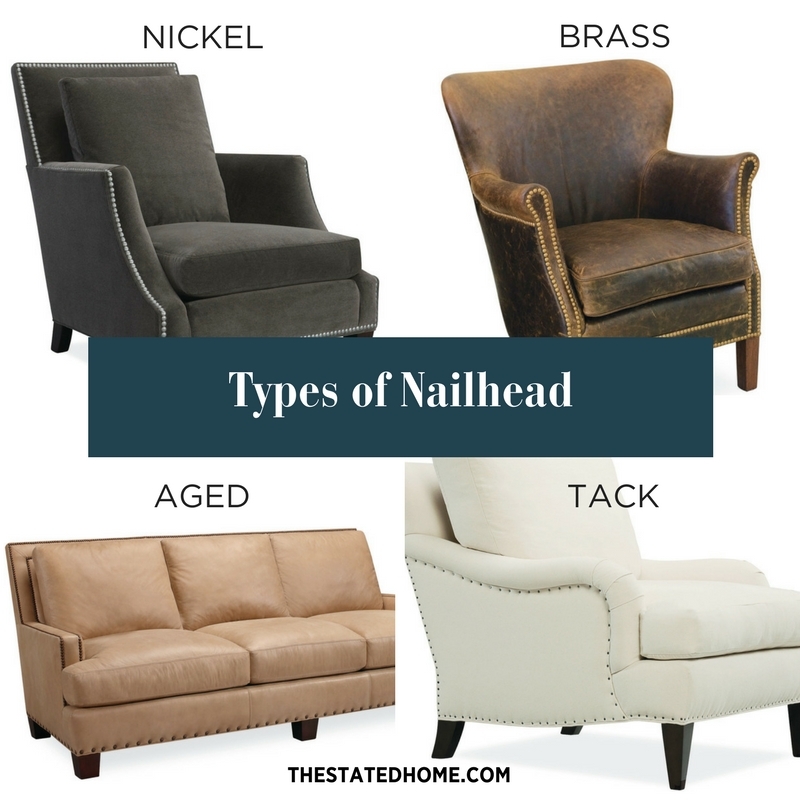 Since it’s not your standard nailhead, it can update otherwise traditional style. Typically darker in color and applied with spaces in between, it creates a faint outline on a piece of furniture. When picking out your nailhead, know that the nails can be applied right next to each other (head-to-head) or with space in between. The latter can update a traditional style or keep up with a modern piece. Apply nails head-to-head for a more classic look. We know that choosing a piece of furniture already requires a lot of decisions, so don’t worry about adding any of these details if you don’t want to! But if you feel like getting creative, these can be fun to play around with. Do you put the nailheads on the seam or next to it. Hi Chris – Nailheads are applied more on where the edge is. The nail should be right next to it – if there is a welt (piping) then the nail will be right to the inside of that. I hope that helps!